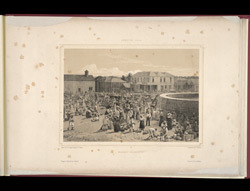 Lithograph from Adolphe Duperly's 'Daguerian Excursions in Jamaica.' It depicts the town of Market Falmouth. The town was created from land bought from Edward Moulton Barrett (poet Elizabeth Barrett's grandfather) in 1790 and was named after the birthplace of the British Governor William Trelawny. It became the capital of the parish of St James and government offices and churches were built there. There were many plantations around Market Falmouth and merchants soon set up stores to supply the estates with provisions. This is a view of Water Square; the circular brick structure to the right of the lithograph is a water reservoir. This was built in 1805 and supplied water to the town until 1950.